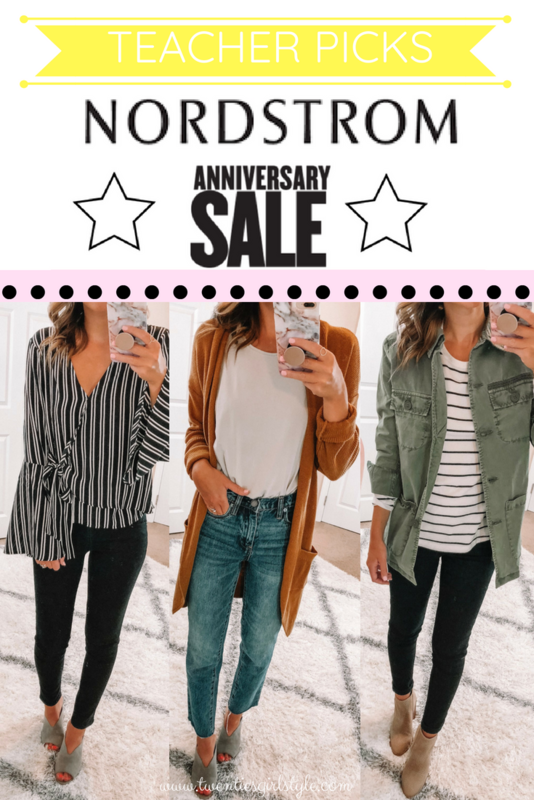 The Nordstrom Anniversary Sale is open for one more week! Have you shopped the sale? I’ve definitely taken advantage of the sale picking up new items for fall and winter. My favorite thing to shop for during the sale though is back to school. It’s a great time to stock up on new pieces for your classroom wardrobe! Today I am sharing my teacher picks including some classroom outfit ideas! You will notice that my classroom style involves lots of basics and layering pieces that can be mixed and matched. My school is pretty laid back, so my staples include non-distressed denim, booties, mules, cardigans and basic tops. Think of this as outfit inspiration and re-create any of these looks by adding your own touches! Scroll down to the bottom for some of my teacher sale picks that are still in stock. Just click the photo to shop! FYI: I am 5’3 and usually a xs/s in tops and a 25 in bottoms. My shoe size is 7! BLANKNYC The Madison Straight Leg Crop Jeans (NOW: // AFTER SALE: // SIZE: 25): I happened to snag these jeans by chance after refreshing the page multiple times daily and I am SO glad that I did. These are the perfect jeans for work. They are non-distressed and have a high waist. I love the slight flare fit and think these will be perfect for back to school when I’m still wearing sandals and espadrilles. I found these to fit true to size. LUSH Relaxed Tank (Now: $19 // After Sale: $29 // Size: XS): This is a great layering basic. It’s so soft and comfortable too! Pair it with a cardigan or jacket and easily dress it up or down! 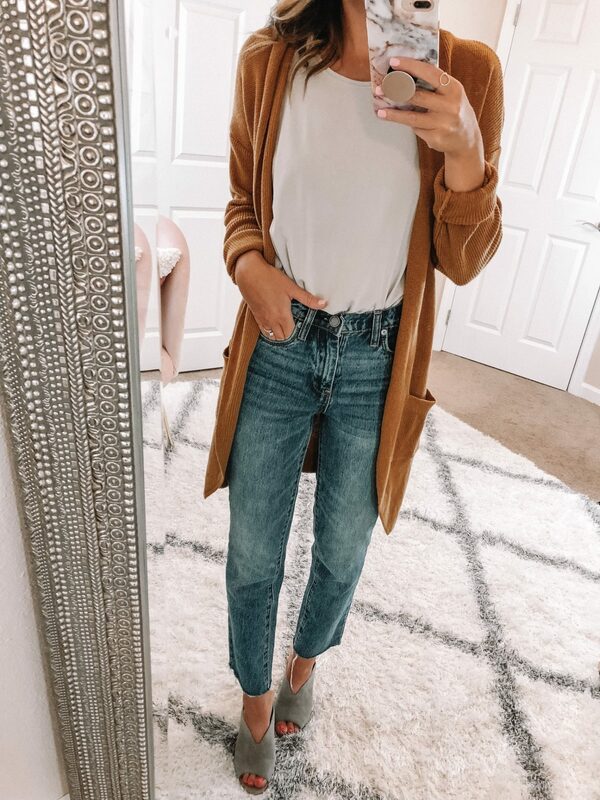 BP Stich Curve Hem Cardigan (NOW: $32 // AFTER SALE: $49 // SIZE: XS): The top selling item from last year is back and better than ever with an updated look! This is one of my go to layering pieces for the classroom. The length makes them perfect for layering with dresses, tights and boots in the winter time! BP Tonya Open Toe Mules (NOW: $50 // AFTER SALE: $80 ): These heeled mules were such a good find, especially for the $50 sale price! They come in four colors, are comfortable and the block heel makes them easy to walk in, which is essential for the classroom! 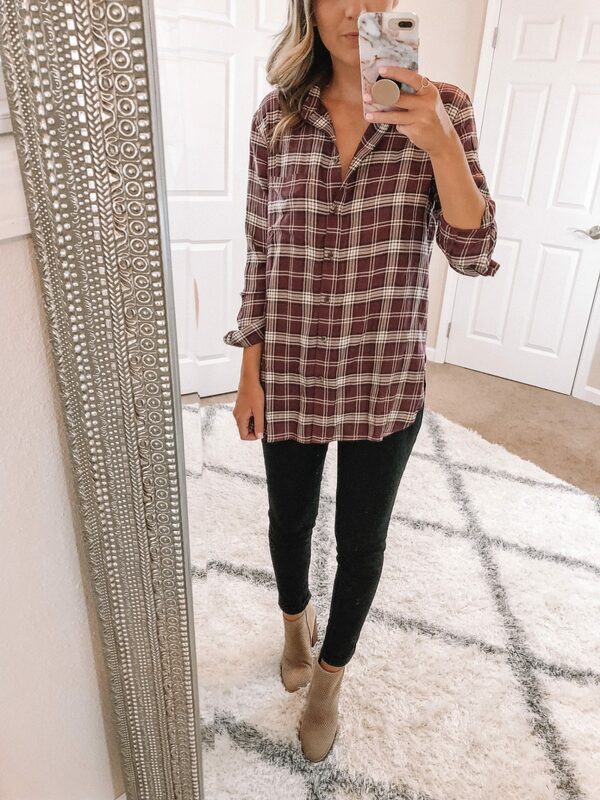 TREASURE AND BOND Plaid Boyfriend Shirt (NOW: $46 // AFTER SALE:$69 // SIZE: XS): I am so surprised this top is still fully in stock! I have a few plaid shirts from this brand that I wear ALL of the time! They are so soft and I love the length of them. They are perfect for pairing with black skinnys in the classroom. I often layer mine up with a cardigan or jacket. WIT & WISDOM Ab-Solution Stretch Ankle Skinny Jeans (NOW: $45 // AFTER SALE: $68 // SIZE: 0): A great pair of black pants or denim is one of my teacher wardrobe staples. I heard rave reviews about these last year and knew I had to get my hands on a pair this year! These are extremely comfortable and have just the right amount of stretch. The best part about these is the soft inner waistband. STEVE MADDEN ‘Rumble’ Perforated Booties (NOW: $87 // AFTER SALE: $130): Neutral booties are my go to for the fall. I love these because the perforation adds a unique touch. These have a stacked heel but are super comfortable and look good with just about anything! They also come in a gorgeous grey suede. BP Drop Shoulder Ribbed Sweater (NOW: $26 // AFTER SALE: $39 // SIZE: XS): A black sweater can be worn with just about anything and this one is a real winner. It has dropped shoulders, with a slouchy fit and I love the ribbing. This one is slightly oversized and looks good tucked in or out. This black sweater will be something I reach for when I am running late. It’s comfortable, can be paired with anything and makes me feel like a million bucks. CASLON Utility Pants (NOW: $50 // AFTER SALE: $79 // SIZE: 25): These utility pants are easy and effortless and a great alternative to your average work pant. These also come in camo and burgundy. Halogen Violet Genuine Calf Hair Mule (NOW: $65 // AFTER SALE: $100): I missed out on leopard mules last year and it was one of my biggest sale regrets. I can’t tell you how many times I got dressed and thought, “This would be so cute with leopard mules!”. This year, these were the very first thing that made it into my cart. They add a fun pop to any outfit and these are so comfortable! These run true to size! I ordered my regular size 7 for a perfect fit! These are one of my top picks for the classroom!! BP Washed Crew Tee (NOW: $15): This tee is not part of the nsale, but it’s currently on sale and is such a good find. It’s really soft and another great basic for layering. It also comes in a gorgeous purple. 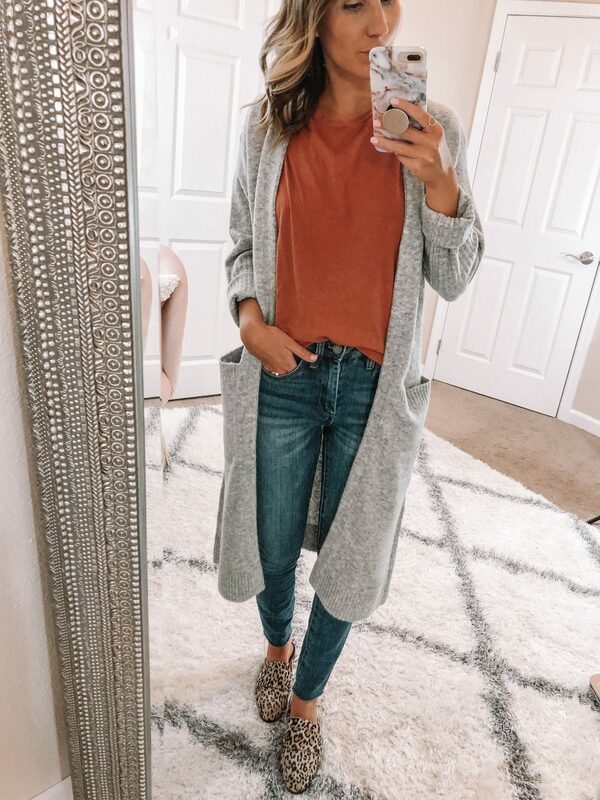 TREASURE & BOND Long Knit Duster Cardigan (NOW: $66 // AFTER SALE: $99): A cozy cardigan is a MUST HAVE for the classroom. I live in my oversized cardi’s all fall and winter long. There is nothing better to beat the chill of a frigid winter classroom! I picked up this option in two colors. It’s thick and cozy and perfectly oversized. It is one size fits all and while I found it to run a little large, I don’t mind! The sleeves are long, but nothing that rolling up can’t help! BLANKNYC The Great Jones Raw Hem Skinny (NOW: $59 // AFTER SALE: $88 // SIZE: 25): Stretchy, comfortable denim that runs true to size and can be worn in the classroom. Get the full review here. 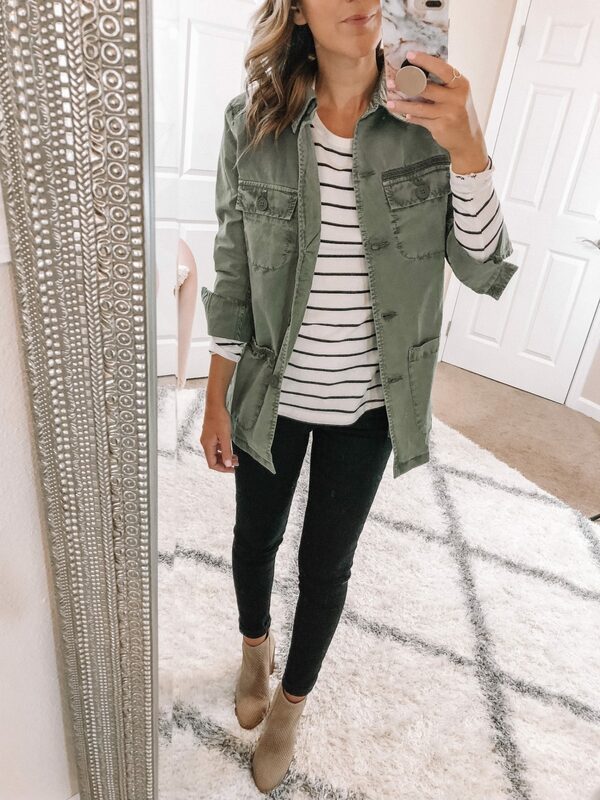 CASLON Utility Jacket (NOW: $50 // AFTER SALE: $79 // SIZE: XS): This is another closet staple! I own a few different utility jackets, but I liked that this one didn’t have a hood and the perfectly worn shade of olive green! This one is actually surprisingly soft too. Throw this one with a basic top and pants to elevate any look. This is a perfect piece for the classroom and I’m currently eyeing it in the camo! 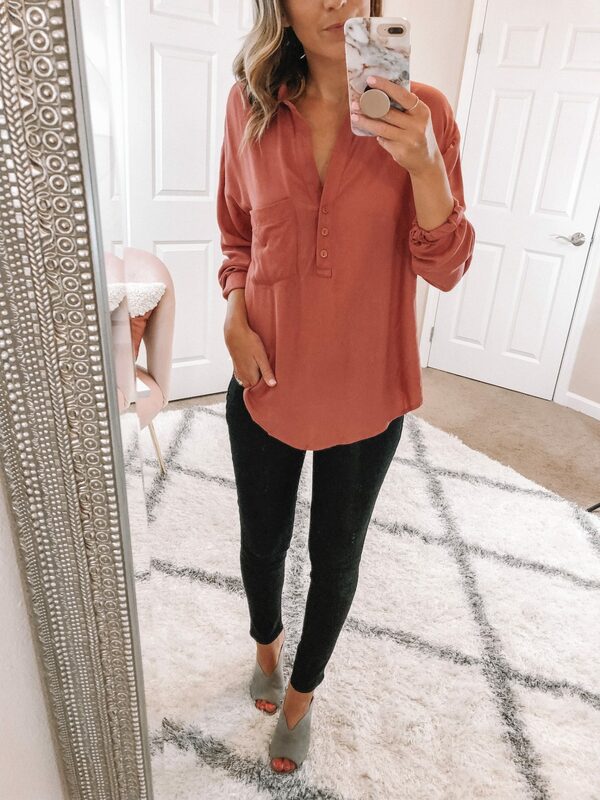 LUSH Slouchy Pocket Henley (NOW: $32 // AFTER SALE: $49 // SIZE: Small): I bought this top in 2 colors because one, it’s perfect for work or the weekend and two, it’s only $32! This top is slightly oversized and easy to style. Tuck it in, knot it up, roll up the sleeves or leave it for an effortless but chic look. This is one piece I know I will get a ton of wear out of! Steve Madden ‘Petra’ Open Side Booties (NOW: $80 // AFTER SALE: $120 ): I got a similar pair of booties last year and literally wore them out. I think I like this year’s pair even more! 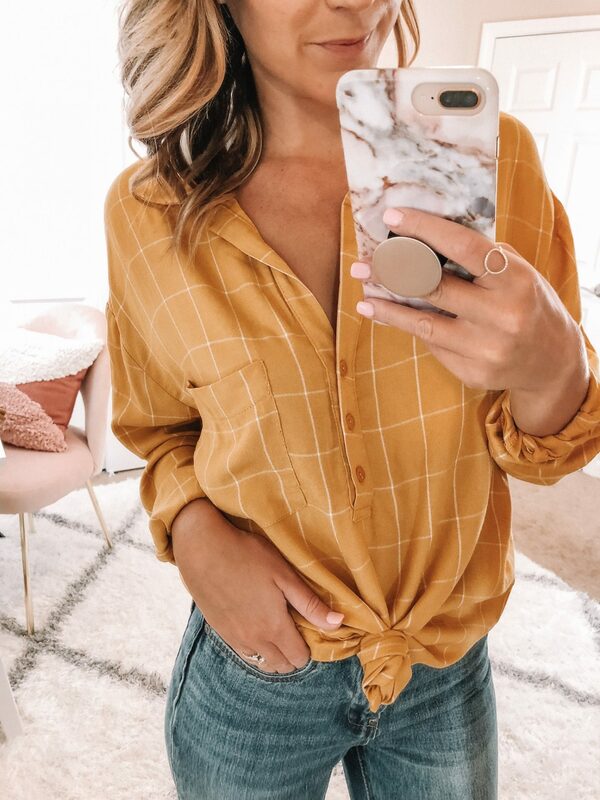 These come in 3 colors and are on sale for a steal at $80! These come in 3 colors, but I love the taupe because it will go with everything. I love the pointy toe and the unique open side design. These are super comfortable, meaning I will be able to stay on my feet all day in the classroom! BP Plaid Button Front Dress (NOW: $32 // AFTER SALE $49 // SIZE: XS): This is a fun take on a plaid dress. I love how flirty and feminine this one is! 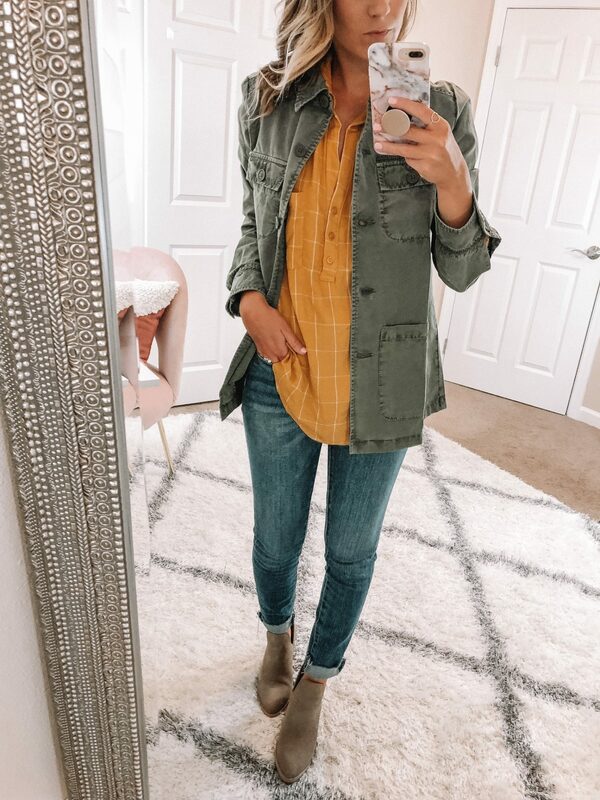 This piece can easily be paired with a denim jacket or cardigan and you can swap out the booties for riding boots as the weather changes! For those dresses that are a little lower in the front, you can always pair them with a cami (as seen below). This is a great trick for the classroom! BP Lace Trim Satin Cami (NOW: $22 // AFTER SALE:$35 // SIZE: XS ): Run, don’t walk to buy this cami! Trust me, you won’t regret it! This is such a pretty piece to wear alone or layer up with a cardi or moto jacket. This was a piece from the sale last year that was brought back this year! It comes in 4 colors, and I picked up the black and emerald green last year and snagged the white this year. I am wearing an XS! 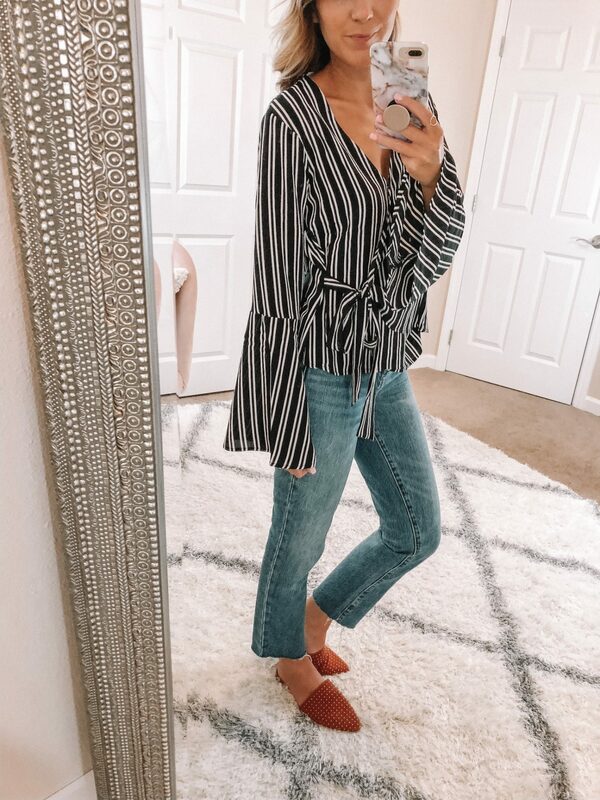 CASLON Striped Bell Sleeve Tee (NOW: $26 // AFTER SALE: $39 // SIZE: XS): If you follow me on instagram, you may have heard me rave about this tee multiple times. I snagged this last year during the sale and was so excited to see it make a return this year! This tee is a gem! 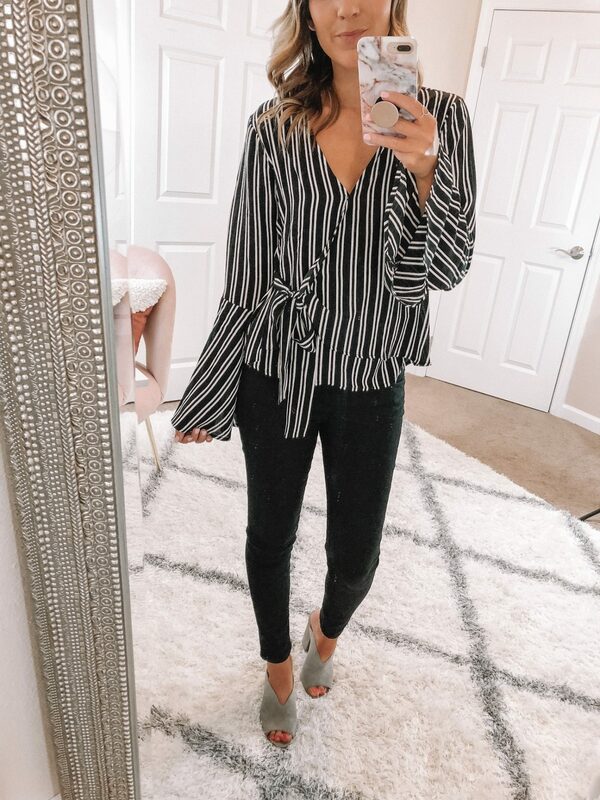 I love the stripes and the bell sleeves and how easily this one can go from work to play! It comes in 3 colors and runs big…I’m wearing an XS! 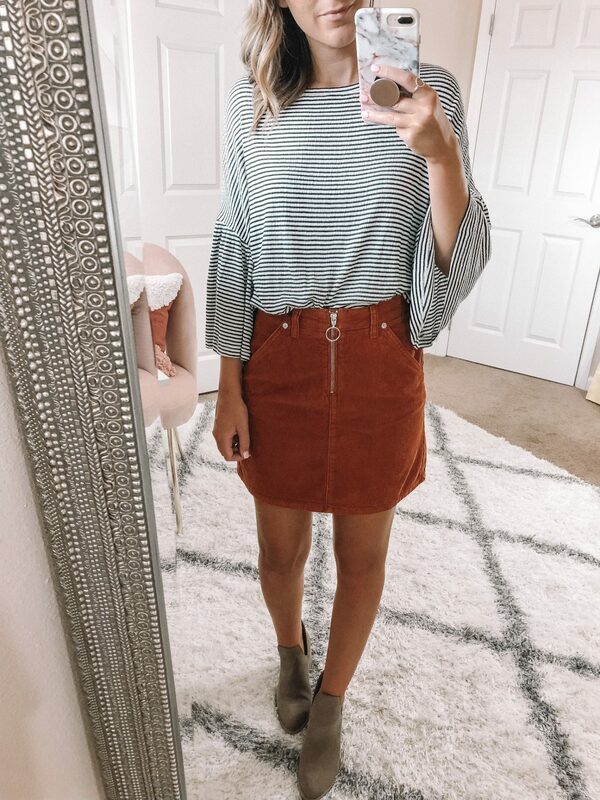 This comfy piece is so cute tucked into a skirt or pants! TOPSHOP Cord Mini Skirt (NOW: $40 // AFTER SALE: $60 // SIZE: US 2): I am so excited about this skirt! I love the color of this little moto inspired mini and how perfect it will be for fall! I can definitely see myself wearing the outfit pictured above in the classroom! As the weather cools, I will swap out the booties for a pair of leggings and riding boots and top it off with a cardigan! TOPSHOP Mo Seam Detail Popper Sweater (NOW: $45 // AFTER SALE: $68 // SIZE: US 6): This sweater was a surprise for me. I ordered it on a whim and ended up LOVING it! It has such a cute fit, with bell sleeves and it’s slightly cropped so it looks great with high waisted jeans. This is an outfit I would wear to work on a casual Friday, but I could also pair this sweater with black pants for an average work day. It comes in 3 colors. 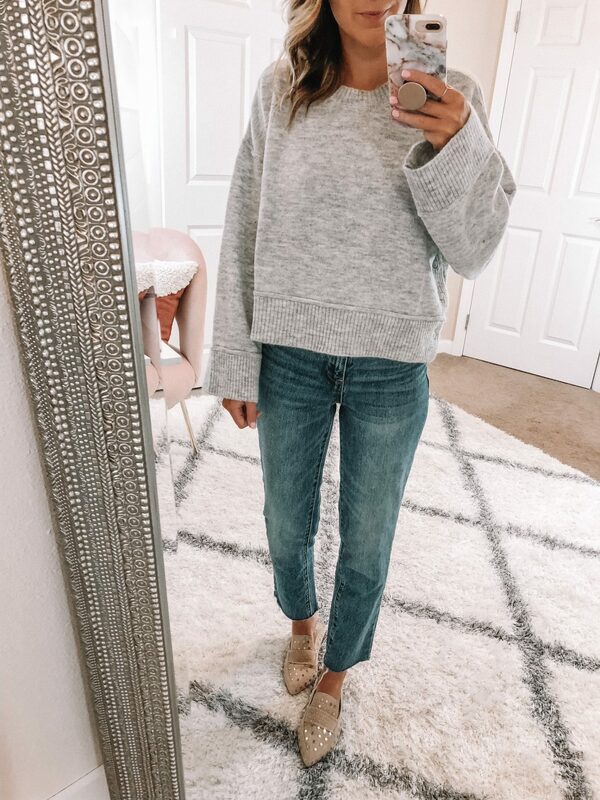 Kristin Cavallari Charlie Studded Loafer Mule (NOW: $85 // AFTER SALE: $130 ): One of my favorite pairs of mules is on sale and comes in 3 gorgeous colors! I got these this spring and love the unique detail of the studs! They also come in black leather and a gorgeous burgundy suede that is perfect for fall! These are the COMFIEST mules I own!! 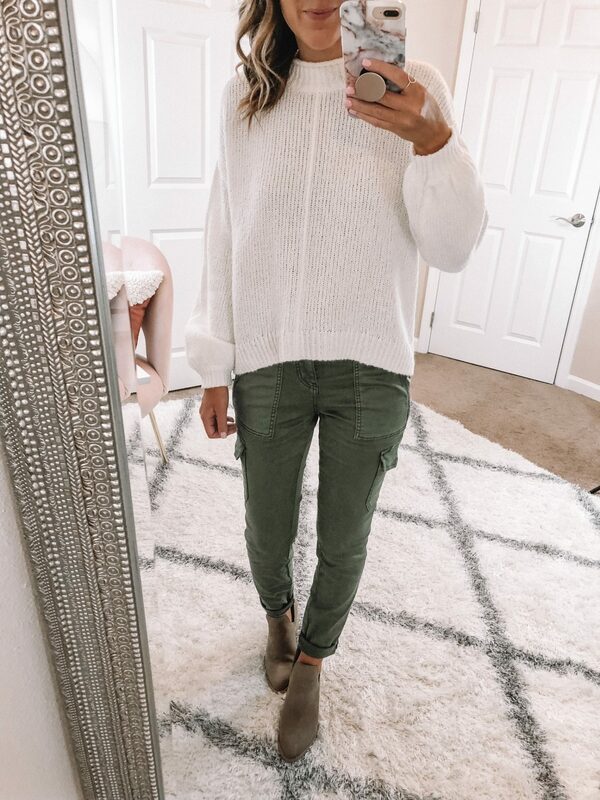 CHLOE & KATIE Bell Sleeve Wrap Top (NOW: $30 // AFTER SALE: $45 // SIZE: Small ): This top is so flattering and I am SO surprised that it’s still fully stocked! This cutie comes in two colors and I considering getting the black floral because of how versatile it is! 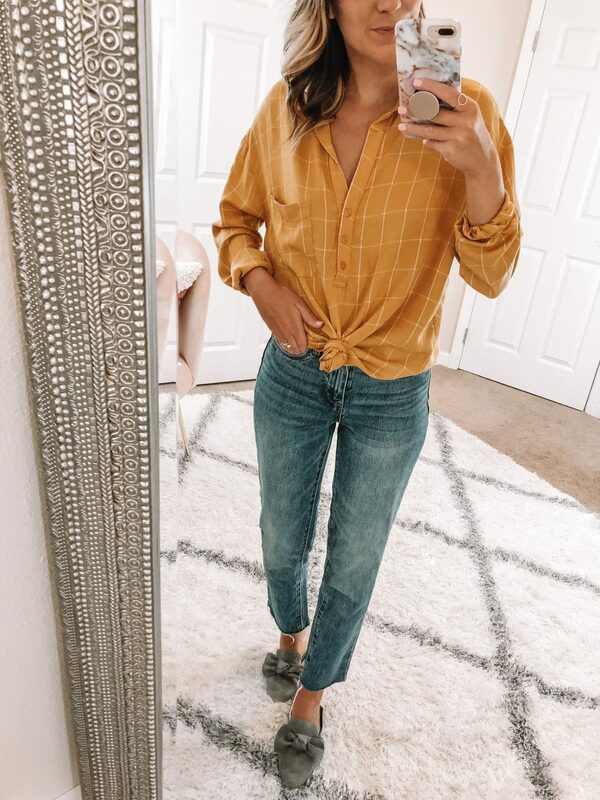 This top can easily be dressed up or down and is another great piece to take from work to date night! I love the v at the front, but that it’s not too revealing. The price is pretty sweet too at just $30! BP Balloon Sleeve Sweater (NOW: $32 // AFTER SALE: $49 // SIZE: XS ): This sweater is SO cute! I love the balloon sleeves and the color choices (it’s available in 3!). I went with white because it will go with everything, but the green and the pink are GORGEOUS (and fully stocked!). Shift Dress (NOW: $32 // AFTER SALE: $49 // SIZE: Small ): One of my favorite sale purchases for the classroom is this little shift dress! 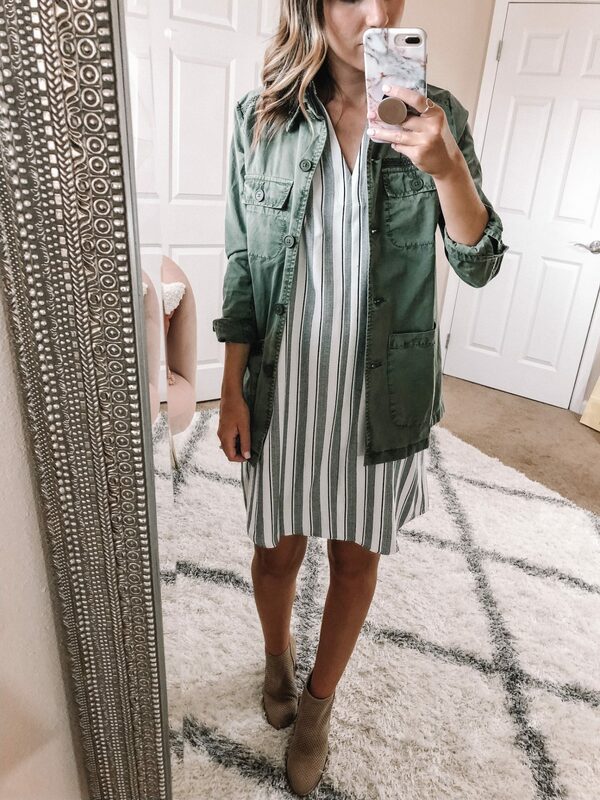 Teachers, this dress is so versatile and a must for back to school! It comes in two colors and can easily be layered up. See all the ways I styled it here! BP Plaid Shirt (NOW: $32 // AFTER SALE: $39 // SIZE: XS): I snag a few of these plaid tops every year during the Nsale. It’s another easy layering piece for the classroom and I love all the various ways it can be styled! Tuck it in for a more put together look (like above), or layer it with a cardigan or jacket! Sole Society Fronto Faux Leather Tote (NOW:$43 // AFTER SALE: $65 ): Say hello to my new teacher work tote! This cutie is the prettiest shade of mauve, is big enough to store my laptop, my planner and a couple of my curriculum books and has a nifty front pocket for my phone! BP Maddy Mule (NOW: $30): These are not part of the Nsale but on sale for just $30 and available in a bunch of different colors. You already know my classroom go to for shoes are mules, and I wore these a ton last year. Plus, how cute is that little bow? BP Slouch Pocket Tee (NOW: $19): If you missed out on the sale tee, this one is NEW, fully in stock and the same price! 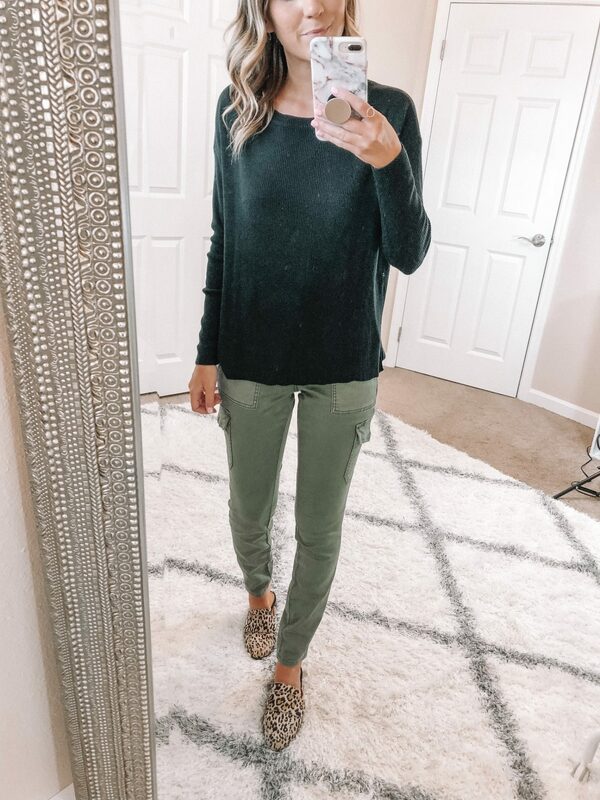 It comes in 6 colors and is a great basic to add to your wardrobe! Steve Madden Trace Studded Mules (NOW: $50 // AFTER SALE: $80 ): I LOVE these mules! I know I’ve mentioned it multiple times, but mules are my go to shoe for the classroom. They are super comfortable and easy to wear and I love that I can take them from the classroom to date night or a weekend outing. I am going to try and snag these in another color during public access (currently eyeing the mustard or snakeskin!). 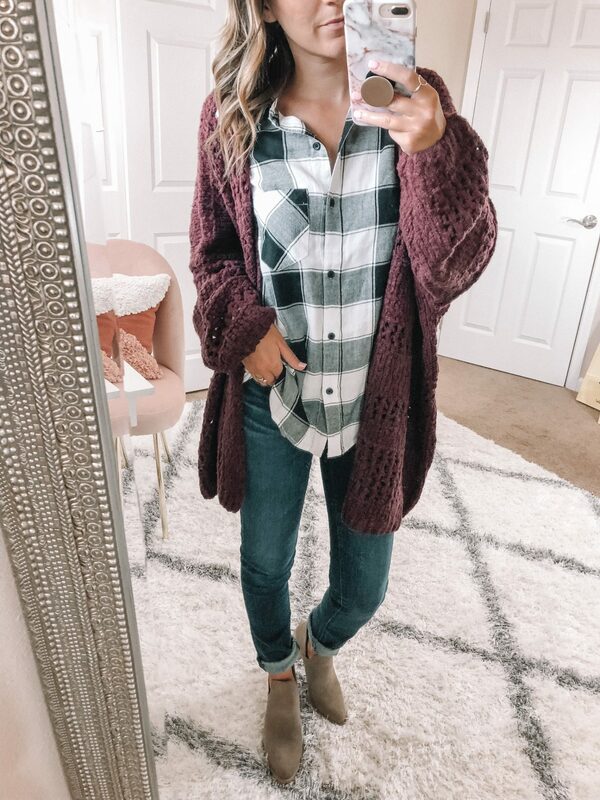 Free People Cardigan (NOW: $99 // AFTER SALE: $148 // SIZE: XS/S ): I purchased this cardigan last fall and literally lived in it all fall, winter and spring! I was so excited to see it was part of the sale and in 3 colors, this grey, a black and wine color (which I purchased). 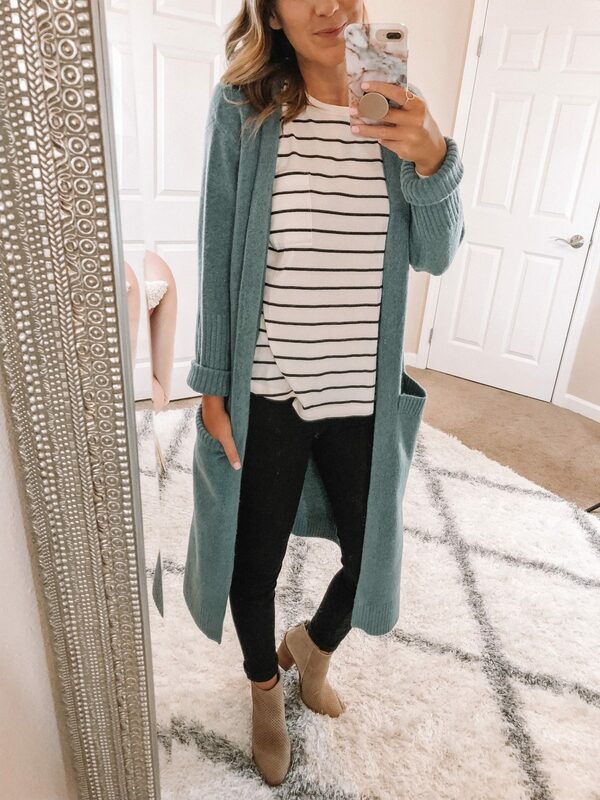 This cardi is definitely a splurge piece but SO worth it! One of the top worn pieces in my closet from last year! It does run big…size down! AG ‘Prima’ Skinny Jeans (NOW: $144 // AFTER SALE: $215 // SIZE: 25 ): AG jeans are notoriously comfortable and high quality. They don’t bag out in the knees or stretch out after a few wears. I love the darker wash and think if denim is allowed in your work place, these are the jeans for the job! Teacher friends, these are my top pick for the classroom. I know they are on the pricier side, but I wore my other AG’s ALL of the time last year. These are flexible (for all those times you spend kneeling at a desk or sitting down on the floor) and super comfortable! Those Blanknyc jeans look amazing on you! So cute!